Use TB68VYN to reference this item. This is a special Thank You and gift to -Ruby- and I am sure the surprise will be welcomed. The "Secret Society of Coin Addicts" is a small group of geocoin nerds, who have made collecting geocoins as their passion. This group originally started with 22 coinjunkies from germany, switzerland and austria. A few know each other through cointrades and -collecting since 2006 and 2012 the group decided to give them a name. This is how the S.S.o.C.A. started with 22 Members from the above 3 countries. 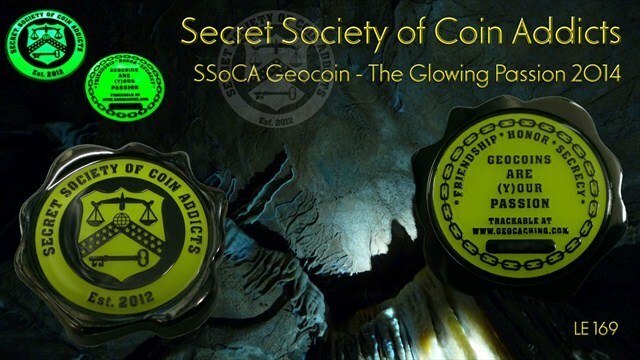 The big passion for geocoins, the special knowledge about the world of geocoins, and due to good contacts worldwide have led to the situation that every member has a fairly big collection of geocoins/trackables in numbers and value. The S.S.o.C.A.-members help themselves in increasing their collection. Either help is needed in finding rare, old coins or in finalizing coin series, or in helping to value coins or in special coin swags. The S.S.o.C.A. likes to give her knowledge about the world of geocoins and stands for all questions around trackables in total and whenever they can help they will do so. General questions from new collectors will be likely answered as spezial questions from longtime collectors. Those questions can be about minting numbers, coin values or quatities of coin series. We are happy, if can give you fast answers but sometimes it depends on our research and can take a time. In all answers we are intending a high quality.